Creating safer streets includes more than adding crosswalks or giving speeding tickets. 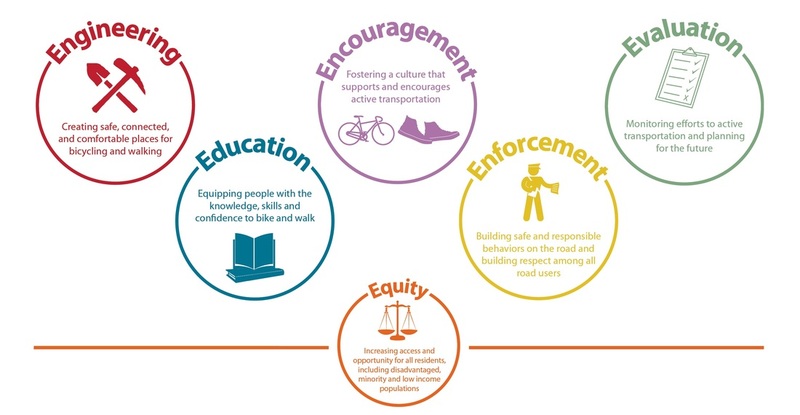 It is a combination of efforts to educate, inspire and empower people to safely walk and bike. You can start by talking to people in your community—school districts, elected officials, government agencies, law enforcement, health advocates, community leaders and neighbors. Successful Safe Routes to School Programs follow the Six E’s. Creating Safe Routes to School includes more than just fixing sidewalks or working with law enforcement. It is important to consider all aspects of creating safer streets. Encouragement. A little encouragement and inspiration goes a long way to getting kids and families interested in walking and biking to school. Organize fun, inclusive events and activities to promote walking and bicycling and generate enthusiasm for the program with students, parents, staff and surrounding community. Education. For programs to be safe and effective, education is very important! 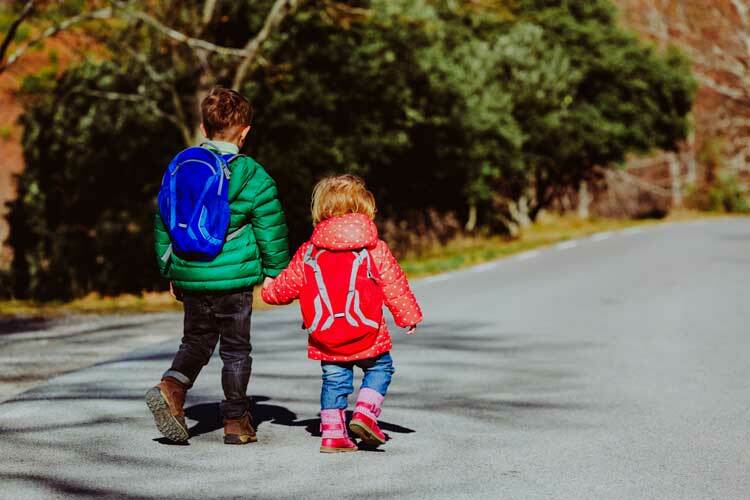 Teaching children how to safely walk and bike to school will create a foundation for Safe Routes to School programs and will empower them to continue to choose active transportation later in life. Ideally, education programs should also include driver safety campaigns for the entire community. Enforcement. Partnering with local law enforcement ensures that traffic laws are obeyed near schools and adjacent neighborhoods and helps build safer streets. Additional enforcement programs can also be extended to school crossing guards, student safely patrols and residents interested in keeping a “watchful eye” on school streets. Engineering. The physical environment can improve the safety of our streets near schools and make it easier and more convenient for students to walk and bike to school. Complete sidewalks, crosswalks, bike lanes and paths can all contribute to the success of Safe Routes to School programs. Work with your local governments to determine necessary changes or improvements to infrastructure. Equity. Diverse communities experience different challenges and opportunities. It is important to understand cultural, social, economic and language differences in varying places and to craft policies, programs and approaches with this in mind. Evaluation. Successful Safe Routes to School programs all monitor and document their outcomes on a regular basis. Thoroughly evaluating and sharing your data from your programs can help inspire other programs, find additional funding, and garner further support for kids walking and biking to school!